It's time again for Secret Recipe Club (Secret Recipe Club) reveal! My secret blog assignment this month was Culinary Adventures with Camilla. As the name of her blog suggests, Camilla is very adventurous with her cooking. She loves trying new ingredients and exploring the cuisine of different countries, and she hopes to inspire the readers of her blog to try something new, too. I actually did make the Chocolate Zucchini Brownies. They were more like a dark chocolate cake than actual brownies and not too sweet, so I really liked them. BUT, they weren't really something new or adventurous, so I thought I should take Camilla's challenge and make something I'd never made before. 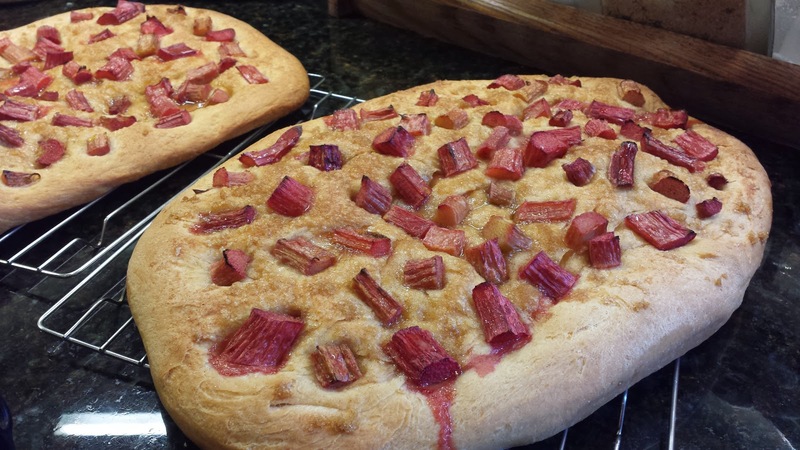 I chose her Rhubarb Focaccia because I have a hard time resisting anything with rhubarb - rhubarb is not my new ingredient. What's new is that I had never made Focaccia before - savory or sweet. I'm not sure I'd ever even eaten it, either. In a large mixing bowl, combine 2 cups flour, salt, and yeast. Combine the warm water, olive oil and honey in a small bowl or 2-cup measuring cup. Stir the liquid ingredients into the flour mixture; gradually add remaining flour, mixing in as much as you can with a spoon and then kneading until it becomes smooth and soft (5 to 6 minutes). Coat the inside of the bowl with olive oil and return the dough to the bowl; turn to coat. Cover and allow dough to rise until it has doubled in size, at least 1 hour. Slightly flatten dough and place it in the jelly roll pan, turning once to coat with coconut oil. Begin pressing and stretching the dough to fit the pan. Then press your fingers through the dough, making dimples all the way to the pan, all over the dough. Sprinkle the dough with chopped rhubarb, pressing it into the dough, and 1/4 cup sugar. Cover and let dough rise until it has doubled in size again, about 1 hour. When focaccia is ready to bake, preheat oven to 425° and generously sprinkle the top with some more sugar and lightly drizzle a little more olive oil on top. Bake 30 to 35 minutes, until the top of the loaf is golden brown. Cool before cutting and serving. This stuff is really good. The crust is kinda flaky and crunchy, and the texture of the dough is nice and soft. The first time I made it, my husband wasn't really impressed. He felt like there wasn't enough fruit and that it was basically just bread. He's not quite as crazy about bread as I am - and this is good bread. 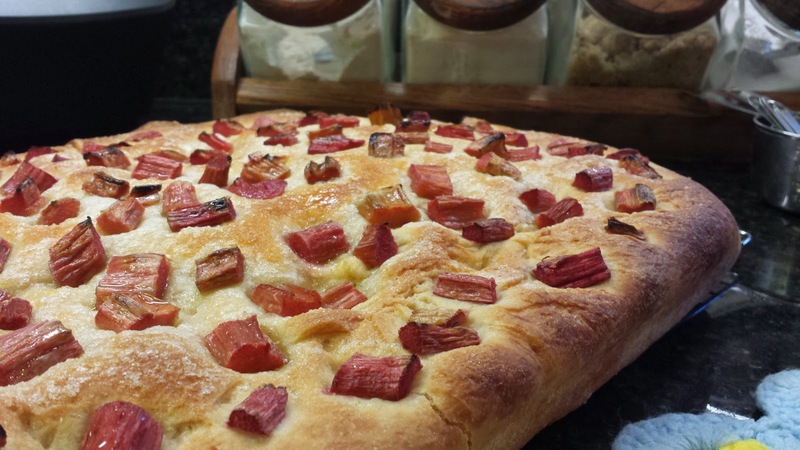 Mostly the problem was that my frozen rhubarb had been thawed, so most of the juice was gone - I saved it and used it in a smoothie, but that didn't do the focaccia any good. 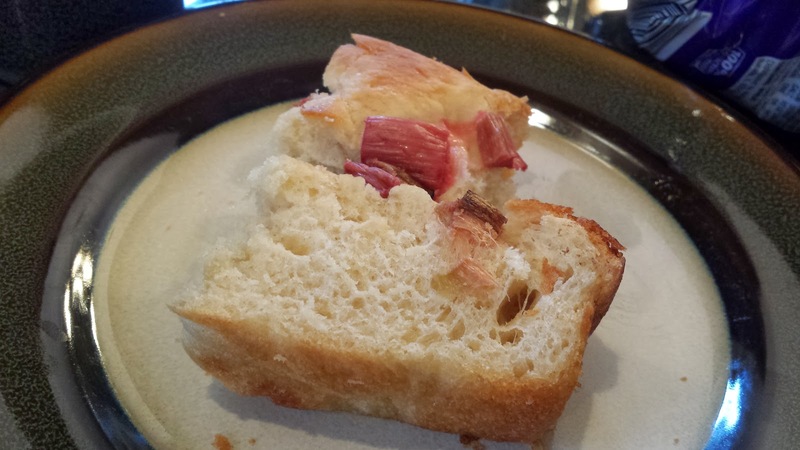 And, a lot of the rhubarb fell off when I cut it, so a lot of it really was 'just bread' even if it was good bread. So I made it again. 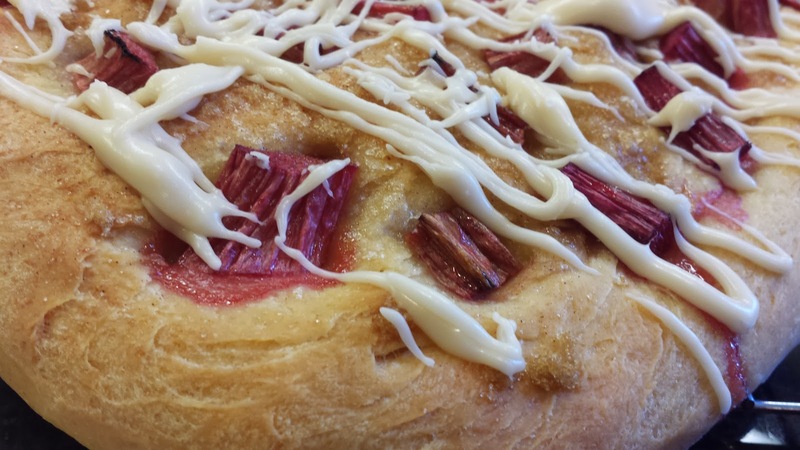 This time I used frozen rhubarb - without allowing it to thaw - and pressed it into the dough. And I split the dough and made two so I'd have more of that lovely crust. What made my husband especially happy is that I made a simple powdered sugar glaze - melted butter, vanilla, powdered sugar, milk - and drizzled it on top. Totally yummy and hard to stop eating - with or without the glaze! Thanks, Camilla, for getting me to try something new!